For more than 15 years, I’ve had a special interest in the definitive treatment of cervical spondylomyelopathy (CSM or Wobbler Syndrome). The two most commonly recognized forms of the disease include the static form (young Great Danes and Mastiffs) and dynamic CSM (middle-aged Dobermans, Rottweilers and retrievers). Over the past several years, I have been involved in development of a new surgical treatment that treats dynamic CSM in a much more physiological manner: cervical arthroplasty using an artificial disc developed by Dr. Filippo Adamo in California (see video below). 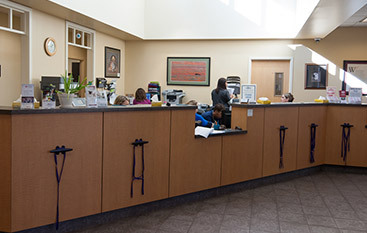 I am the first veterinary neurosurgeon in the mid-Atlantic area to perform the procedure. 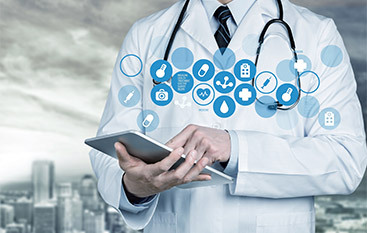 Not only do we feel this surgery provides a better outcome for dynamic CSM; it is less invasive, requires minimal post-op care and hospitalization, reduces post-op pain and discomfort, has a lower mortality rate and a lower cost to the owners. Some dogs that are ambulatory when they come in can be operated on as outpatients. Dynamic CSM, also known as disc-associated Wobbler Syndrome, is a particularly devastating disease that affects the cervical and intervetebral discs, causing a narrowing of the cervical canal and compression of the spinal cord. 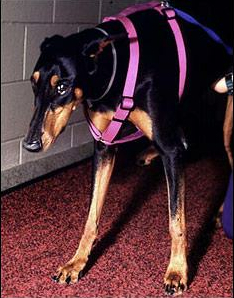 The syndrome generally affects large breed dogs, especially Doberman Pinschers and Rottweilers, that are 4 to 8 years or older, but it can affect any size, breed or age of dog. For many years, surgery has been the gold standard of treatment for this condition. 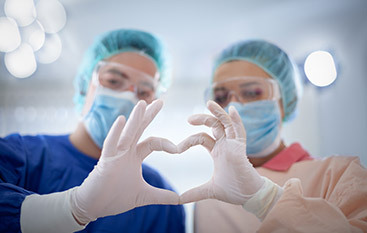 Surgical approaches have provided far superior outcomes to those of medical treatment. Studies have shown that 81% of dogs treated surgically with ventral slot, dorsal laminectomy, or distraction and fusion improved, while only 45% to 54% of dogs improved with medical treatment. Surgery has meant long post-operative recovery and the risk of “domino lesion,” in which the problem occurs subsequently in another location of the spinal cord. Similar to a relatively new surgery for back pain in humans, cervical arthroplasty using the artificial disc system developed by Dr. Adammo treats the disease in a more physiological and biomechanically sound manner. It also prevents domino lesion as the implanted disc provides immediate distraction and maintains mobility at the site, making the development of a new lesion at an adjacent site less likely. 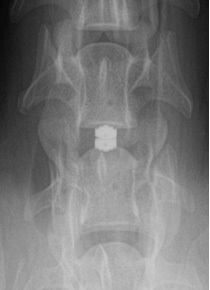 After the damaged disc is removed, a slot is created in the surrounding vertebrae, then the titanium artificial disc is put in place, keeping the vertebrae separate while allowing normal movement. This is in contrast to disc fusion, which can transfer stress to surrounding areas, causing further damage along the spine. Note that MRI is a key tool in the diagnosis of dynamic CSM and post-operative reassessment, as it is able to better define the site, severity and nature of the spinal cord compression than either cervical myelography or CT-myelography can. As the artificial discs are made of titanium, MRI scans can be used post-operatively. Figure B (above). 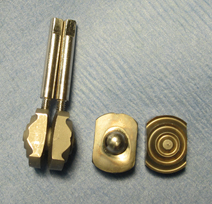 Artificial discs articulated and connected to insertion pins (L) and the two halves of the artificial discs disarticulated showing the inner and outer surfaces. The artificial discs are made of a titanium alloy. 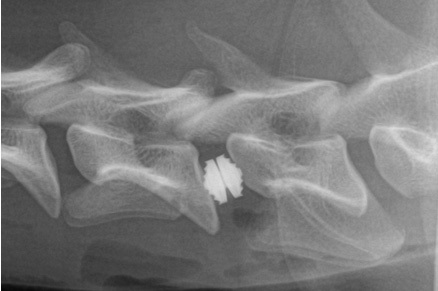 Lateral and VD (below) post-operative radiograph of a properly-positioned artificial disc placed between C5-C6. The disc provides excellent distraction, but also allows 30 degrees of mobility in the intervertebral space.